Trailer Construction Example - What's Wrong With This Picture? Learning good trailer construction by examining bad examples is a great way to focus on the details. This photo actually shows 4 points of “less that careful thought” in the way the trailer is put together. Can you pick them out? This trailer caught my attention because it’s a creative example of a Do-It-Yourself trailer build. In general, the idea is great, and the trailer construction is pretty good. However, looking a little closer, there are some details that can use some better attention. I’m pretty sure this trailer started life as a mobile home foundation. You can tell that by the size and configuration of the I-Beams as well as the cross members. At some point it was drastically shortened and reconfigured into a 16′ flatbed utility trailer — and it looks really beefy. They did a nice job on a lot of the trailer construction, but missed a few key pieces in the design. 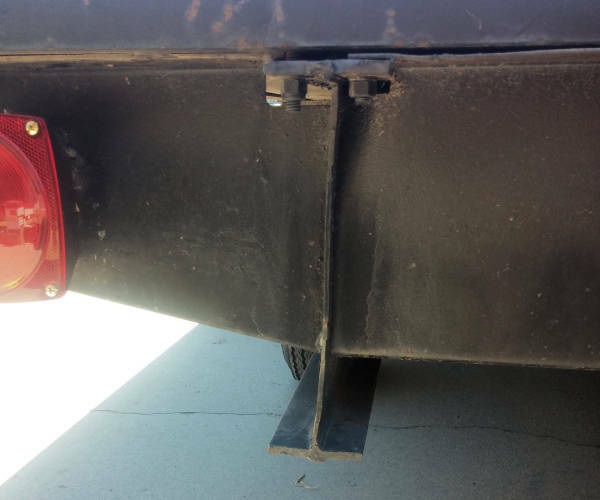 Unfortunately, these key points also affect the way the trailer performs. Let’s have a closer look. Can you pick out the 4 issues with trailer construction in the photo above? The most obvious issue, is contact of the spring eye with the trailer frame. That’s not a happy situation as it defeats the purpose of load sharing with the equalizing rocker. There is more wrong in the trailer construction than I was able to quickly diagnose while just looking at it, because the trailer is sitting almost level, yet it gives the impression by the positioning of the equalizer that the tongue is really high. I suspect one of the axles is not centered on the leaf spring, or there is some stack spacing issue, but I could be wrong. Anyway, just looking at the equalizer rocker, the root issue for contact is the height of the bracket which the rocker pivots on. It’s the same bracket used on the stationary ends (front and back) for the springs. Even if everything was sitting properly, that short bracket does not allow the rocker to pivot enough. The second issue should also be fairly obvious. Notice the rust on each of the welds where the spring mounts connect to the frame. When the welder finished, he either did not paint the welds adequately, or he did not clean the welds prior to painting. Of course, this is only a problem if you want the trailer to last. The third issue may not be so obvious. Look at the material used for the I-Beam. These are very stout axles that were originally on a mobile home. The suspension is also very stout (meaning high load capable). Why then, are the thick brackets which carry big loads welded directly to the thin web of these I-Beams? You can get a better feel for this by looking at the trailer construction at the rear of the trailer, and by reading this post showing stresses. The solution? We recommend some added material at the point of connection. A simple strip of steel (3/8″ or 1/2″ thick) between the I-Beam and the suspension brackets (extending 6″ beyond the brackets front and rear) will distribute load stress to the I-Beam much better. It’s not that the beams are weak, it’s just the localized loading. Such a strip will also minimize welding on the high stress areas of the main beam. Remember that welding changes the local molecular structure which weakens the beam. I may get some argument about the 4th issue. I have seen success, and I’ve seen hiccups using mobile home axles, wheels and tires. You can spot these easily. 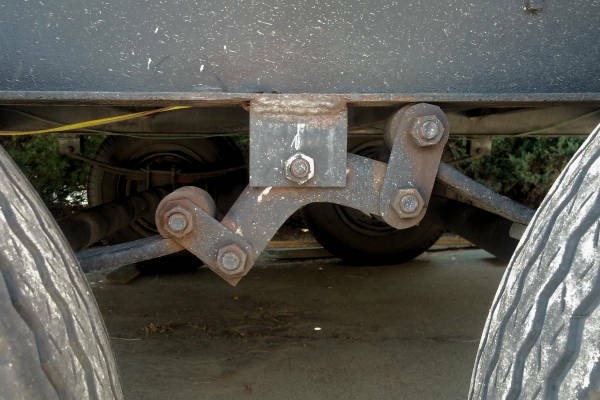 The wheel connection to the axle at the inner perimeter of the wheel is a characteristic of mobile home axles. The issue is they are hard to balance at times, and they sometimes have other problems. If you have the choice, it’s usually better to use purpose built “trailer” axles — especially if you will be using it much. As an interesting side note, the trailer owner says this trailer has an obnoxious vibration starting around 38 mph and gets worse then mostly goes away around 50 mph. To me, that sounds like a classic tire balance or rim alignment issue, that may also connect to the spring and equalizer issues. I applaud the builder of this trailer, though they need to do a little more research — like perhaps Axles 101. They took a mobile home frame that was likely trash, then repurpose it as a heavy duty utility trailer. I think it’s awesome. I don’t know how old it is, or anything about it’s life, but thank you for letting us use the example.